The events of the Lunar Chronicles series are over, but the world doesn’t just go on peacefully with perfect trust afterwards. Relations are still strained between governments, and there are consequences from former royal edicts to be dealt with. Among those are the rogue half-wolf breeds still roaming the earth. Cinder’s best android friend, Iko, sets out to control this problem herself. 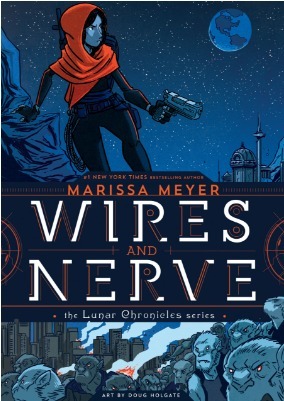 I loved the Lunar Chronicles, and so even though graphic novels aren’t really my thing, I definitely had to read this one. Awesomely, my experience was the complete opposite as with my last GN. I loved the story and the art here. Doug Holgate’s style reminded me in many ways of Lucy Knisley’s style. It was very welcome as I went through to check in with all those beloved characters and find out what’s happened to them in the time since the series ended. Furthermore, this book didn’t feel like a way to cash in on the old series. There were a few bits of catch-up that made it so anyone could read this book without reading the series first. Otherwise it was just a story in the same world from a new perspective. There were new challenges and new ponderings, and I’m happy to know that this is its own series that will continue past this initial volume. I can’t say how well it would read to someone who isn’t already in love with the series, world, and characters. For me, though, it was a brilliant way to both revisit some favorites and start a new storyline to devour. This entry was posted in 2017, Visual, Young Adult and tagged Asia, POC, speculative. Bookmark the permalink. I really want to get this. It was just kind of pricey. I will have to check it out at some point. I do want my own copy one day, but that’ll have to wait. I just got a review copy of this one but I haven’t read the books so I’m glad to know it will catch me up enough to enjoy it!